The NUEXCO Exchange Value® is TradeTech’s judgment of the price at which spot (one delivery within 12 months of transaction date) and near-term (one delivery within 12 months to 1 1/2 year of transaction date) transactions for significant quantities of natural uranium concentrates (U3O8) could be concluded as of the last day of the month. The Transaction Value is a weighted average price of recent natural uranium sales transactions. c) Transactions involving a sum total of at least 2 million pounds equivalent U3O8. The UF6 Value is TradeTech’s judgment of the price at which spot and near-term transactions for significant quantities of natural uranium hexafluoride could be concluded as of the last day of the month. The SWU Value is our judgment of the price at which spot and near-term transactions for significant quantities of enrichment services could be concluded as of the last day of the month. The Daily U3O8 Spot Price Indicator is TradeTech’s judgment of the price at which spot and near-term transactions for significant quantities of natural uranium concentrates could be concluded as of the end of Monday, Tuesday, Wednesday, and Thursday (excluding of US Federal government holidays and the last day of each month when TradeTech's monthly NUEXCO Exchange Value® is published). The Mid-Term U3O8 Price Indicator is TradeTech’s judgment of the base price at which transactions for mid-term or intermediate delivery of natural uranium concentrates could be concluded as of the last day of the month, for transactions in which the price at the time of delivery would be an escalation of the base price from a previous point in time. • All Market Values are expressed in terms of US$. - Data from recently completed transactions. - Data from pending transactions. - Firm bids to buy or borrow, and firm offers to sell or lend. - Prices purchasers or rates borrowers have expressed a willingness to pay, but for which we are not aware of firm bids to buy or borrow and prices sellers or rates lenders have expressed a willingness to accept, but for which we are not aware of firm offers to sell or lend. - Prices associated with deliveries under old or renegotiated contracts, or other than arm’s-length transactions. - Charges for transportation other than that customarily provided by suppliers. - Prices of services or materials delivered under long-term contracts with primary suppliers. • In calculating the Transaction Value, we do not account for the price of uranium delivered in connection with contracts which call for “market price” mechanisms. This exclusion applies particularly to contracts in which delivery prices are expressed as a function of future Exchange Values or any other indeterminate variable. Also excluded from the calculation are any other transactions in which the delivery price is defined in such a way that it cannot currently be determined. • The sample time for the Transaction Value is extended for up to six months, if necessary to satisfy the minima for the number of transactions (10) and quantity of material (2 million pounds equivalent U3O8). The sample time is extended beyond six months only as necessary to include a minimum of five transactions and 1 million pounds equivalent U3O8. Any required currency conversions to US dollars are made on the basis of conversion rates in effect on or near the transaction date. 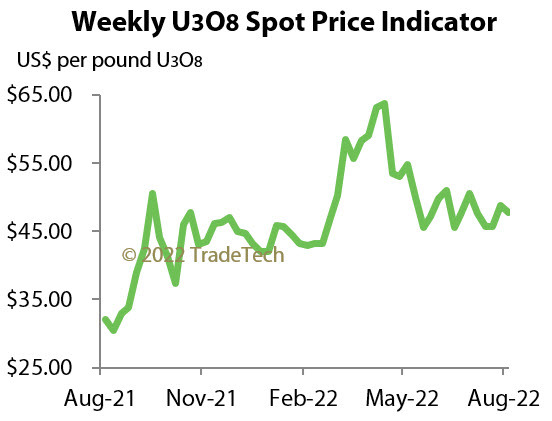 • The Mid-Term U3O8 Price Indicator applies in cases where deliveries begin immediately beyond the 12-month spot delivery window and occur within one to two years from that point, as either stand alone agreements or as part of longer-term contracts. • The Restricted SWU Value applies to all services delivered in the United States and European Union. • The Unrestricted SWU Value applies to all enrichment services delivered outside the United States and European Union. * Unrestricted/Restricted Market Values were first applied in The Nuclear Review No. 301 (September 1993 issue). The designation of Unrestricted/Restricted Market Values for uranium products was dropped in The Nuclear Review No. 398 (October 2001 issue), since the Unrestricted Market distinction had become irrelevant with the cessation of US and European Union restrictions against all but Russian-origin uranium. The designation of Unrestricted/Restricted Market Values for enrichment products was dropped in The Nuclear Review No. 510 (February 2011 issue), because supplies of SWU, whether for the restricted or unrestricted market, have become small over the past year, the market has come to exhibit no price differential between offers for unrestricted and restricted enrichment (SWU) demand.